On the afternoon of April 2nd, I checked my email and saw that I had received a very exciting email from Radio 104.5! I had entered my email once weeks ago to win tickets to see Superorganism but, being a usually unlucky person, completely forgot about it. Superorganism is a band with 8 different members, each from a different country. The lead singer, Orono, met the rest of the band at their concert after originally talking over Skype and thus, Superorganism was formed. A lot of their songs include really unique and recognizable sounds like a drink being poured and the sound of a cash register. My friend Martina and I left school on Wednesday at about 2pm so that we could make it to the studio in time. Once we got there, I showed my Madrid metro pass as photo ID and we sat with the other six pairs of excited winners in the lobby of the iHeart Radio office. After about 15 minutes, someone came out to tell us the rules and procedure for this event. The band would come out and play about 3 songs, followed by an on-air Q&A session with the radio host and then we would each meet the band to take a photo. Once we entered the studio, there was to be no talking or recording of the performance. Though I was not allowed to take any videos, I did get some photos of Superorganism in action! We were ushered down the hall and into a small studio with a stage and rows of folding chairs. The on air sign lit up just as the band filed out and onto the stage, sitting on the ground in a circle with their instruments. They played the song “Everybody Wants to Be Famous,” followed by “Something for your M.I.N.D.” This song usually features the sound of a soda can being opened and something that resembles a bite being taken out of food, sounds that the band created live into the microphone by biting into apples at the same time and popping the tab open on a coke. 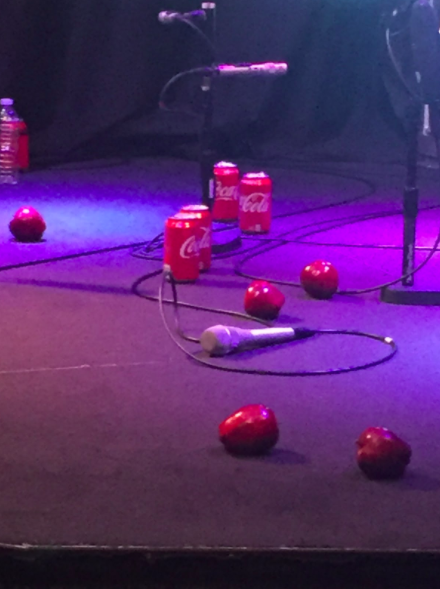 And yes, they did proceed to eat the apples and drink the sodas during the rest of the performance, which looked like they were having a really great time up there. 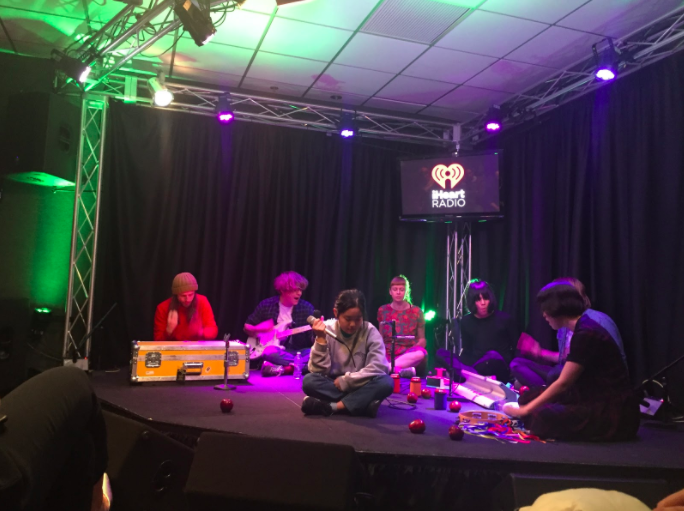 They answered questions about how they met as a band and about their collaborative process, saying that they all really just work together well and sometimes make their final songs on the first recording take. The lead singer said that it was difficult to create songs while she was in college, waiting for her roommate to go into the bathroom so that she could record. They seem to have an incredibly fun chemistry as a band and really each bring something unique to the group. Finally, it was time for the photos so we all formed a small line and took turns meeting them and getting a picture. Though our photo was awkwardly posed, we had a great time and it was a really cool experience to get to meet and see a band I love play live. I can truly say that Superorganism was super nice and super talented.